Temporarily relieves itchy eyes due to pollen, ragweed, grass, animal hair and dander. 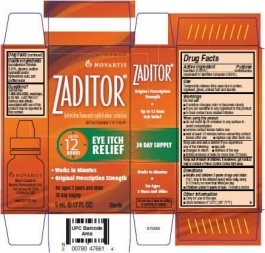 Zaditor Eye Itch Relief Antihistamine Eye Drops are ideal for relief of dry, itchy eyes. These soothing eye drops work in minutes to help relieve allergy-related itchiness and irritation for up to twelve hours. Safe for use on people without contacts ages three and older, one package of these prescription-strength eye drops includes a 30-day supply, so you can go about your day with clear, happy eyes. Put 1 drop in the affected eye(s) twice daily, every 8-12 hours, no more than twice a day. Active Ingredients:Ketotifen (0.025%) (Equivalent to Ketotifen Fumarate [0.035%]).